2 PMS colors printed on Side 1 of 14pt C1S White Semi-Gloss stock. Coated with Aqueous Gloss. H1 business card slits on right pocket. 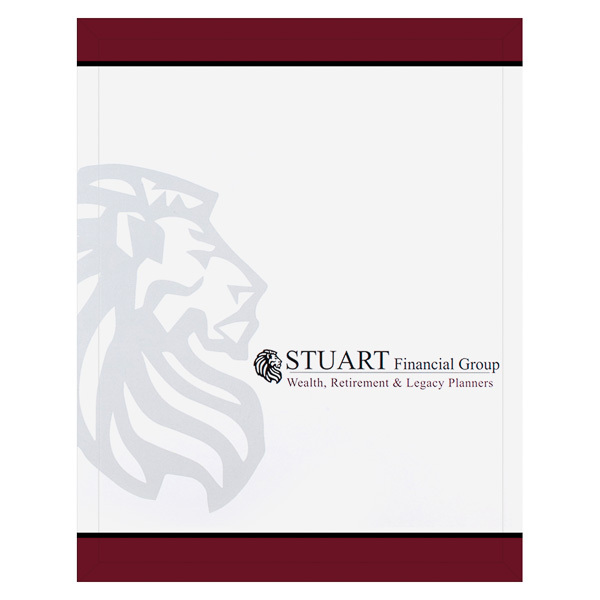 Stuart Financial Group's majestic lion logo gazes over the front cover. In the shadow of the large gray lion, a smaller logo points to the brand's name and description. Maroon bars at the top and bottom add warmth to the white panel with luxurious wine tones. The pockets bear contact info and the logo, both of which reappear on the back cover to reinforce the brand's identity. Four-color process on Side 1 of 12pt C1S White Semi-Gloss stock. Coated with Aqueous Gloss. V4 business card slits on right pocket. Orange and blue accents promote professionalism and efficiency for the ACBSP. Its triangle logo implies upward mobility and progress, a sentiment enhanced by lines that mimic rays of light. 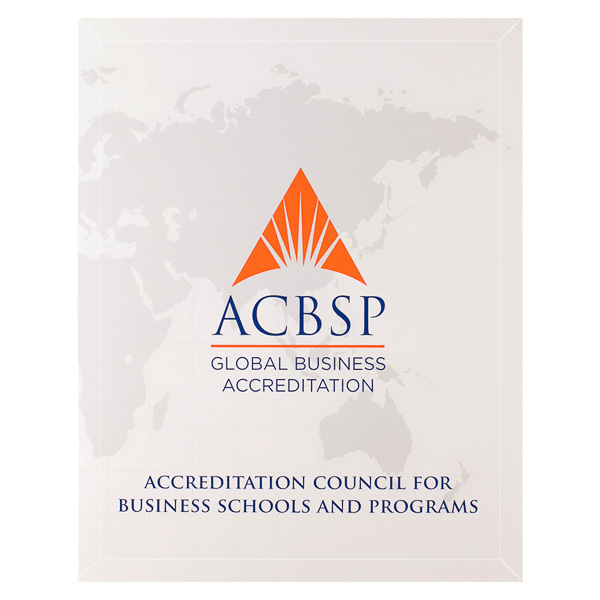 Behind the logo, a world map informs clients that the ACBSP is a global organization. Contact information for the U.S. office appears on the back under a map of the Americas to reinforce its location. Side 1 printed with 1 PMS color using heavy coverage and 1 embossed area. 80lb Flax Felt stock uncoated. H2 business card slits on right pocket. Teal stencil and script lettering on a white background appeal to Legacy Athletic's vintage style. Its embossed logo has a raised texture to emphasize the brand identity. Both interior pockets are teal, with the logo and contact information printed at left. 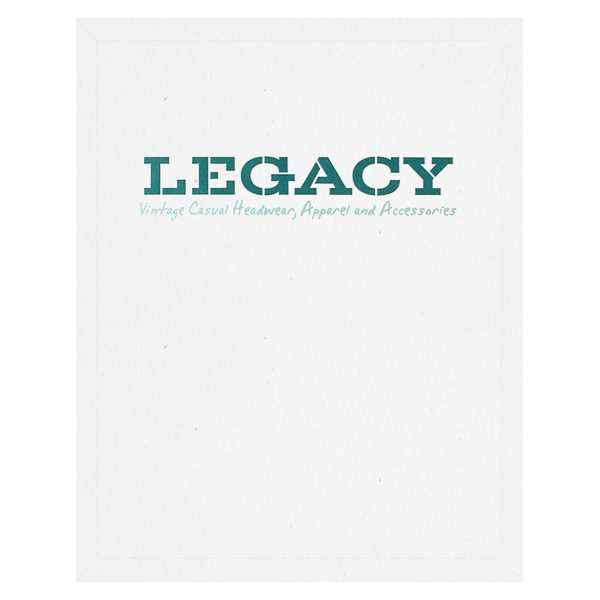 The back cover is dedicated solely to the clothing retailer's "Live Your Legacy" emblem. 1 foil stamped area on Side 1 of uncoated 100lb Dark Blue Linen stock. H1 business card slits on right pocket. 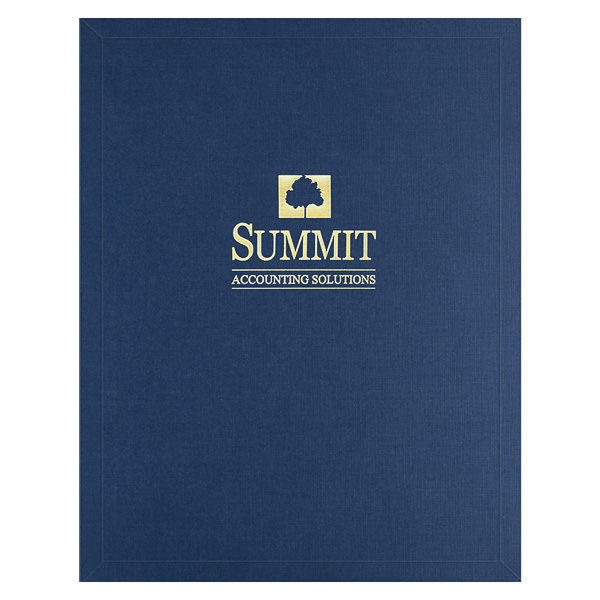 Navy blue panels' rich corporate color reassures clients of Summit Accounting Solutions' professional demeanor. A striking Metallic Gold foil stamp complements the elegant blue color, adding a burst of sunshine to the design. The foil's surface is smooth to the touch, whereas the stock has a linen pattern. These differing tactile elements give this design a unique feel that encourages recipients to build sensory memories of the brand. Outfitted with Conformer® expansion scores, both pockets can carry up to 3/8" of paper, for a combined capacity of 3/4". The expansion scores can comfortably house all of your 8 1/2" x 11" print materials, yet still let the panels lay smooth and level whether holding one page or a thick presentation packet. 1 1/8" reinforcement strips on both panels protect against wear and tear; along with the pockets, they can be imprinted with custom branded elements or images.